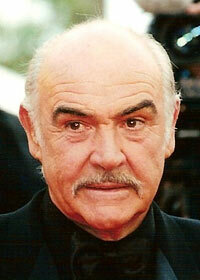 Celebrated Scottish actor, producer and Academy Award winner. He most famous films include the James Bond series, Indiana Jones and the Last Crusade, Highlander, The Hunt for Red October and the Rock. Lancelot:"Perhaps fear made them go back when they should have gone forward. King Arthur:"And you felt no fear?" Lancelot:"I have nothing to lose, so what do I have to fear? King Arthur:"Do you have a profession?" Lancelot:"I live by my sword." King Arthur:"You fight for pay?" King Arthur:"Have you ever run the gauntlet before?" King Arthur:"So how did you do it?" Lancelot:"It's not hard to know where the danger is if you watch it coming." King Arthur:"Well others have found it hard enough." King Arthur:"I don't believe I've ever seen such a display of courage, skill, nerve, grace, stupidity." Professor Henry Jones: "You call this Archaeology?" Professor Henry Jones: "I suddenly remembered my Charlemagne. 'Let my armies be the rocks and the trees and the birds in the sky'." Professor Henry Jones: "Well they don't come any closer than that!" Professor Henry Jones: "My boy, we are pilgrims in an unholy land." Professor Henry Jones: "Why are you sitting there resting, when we're so near the end?! Come on, let's go!" Professor Henry Jones: "Our situation has not improved." Dr. Robert Campbell:"I promise you, when this is over you can cry all you want and I won't say a word." Dr. Rae Crane:"You promised I could cry all I want!" Dr. Robert Campbell:"Oh yes I did. Ok, well go ahead. Knock yourself out." Dr. Robert Campbell:"Good god woman, must everything be a full scale debate with you?! Just do it!" Dr. Rae Crane:"Get drunk somewhere else!" Dr. Robert Campbell:"Hey! I live here. Get sanctimonious somewhere else." Dr. Robert Campbell:"I found the cure for the ******* plague of the twentieth century and now I've lost it! Haven't you ever lost anything doctor Bronx? Your purse? Your car keys? Well, it's rather like that! Now you have it and now you don't!" Captain Marko Ramius:"Most things in here don't react to well to bullets." Captain Marko Ramius:"A little revolution now and then, is a healthy thing. Don't you think?"